Exciting! Beautiful ship. Looking forward to a bit of woodworking at heeling angles. Should be interesting. 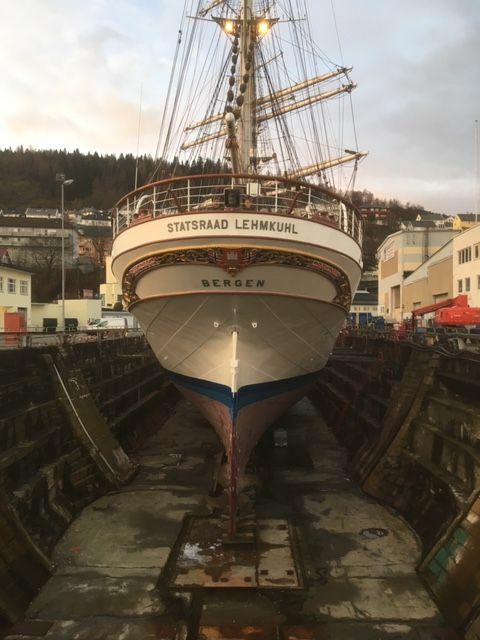 I got the grand tour of the ship yesterday while she was in dry dock, and the ship is incredibly well maintained and just oozes of history, tradition and quality. I hope that I will be able to continue with small woodworking projects over there as well, but I can't see why not. If you didn't sail before (I mean with the wind) you will have to learn a lot of new vocabulary and concepts, and acquire new skills. Of course this kind of ship needs a core crew of professionals but I guess many would pay to pull on the halyards on such a ship. You can give a hand to the carpenter. There is a professional crew on board, but not enough to run the ship on sails. So there is always a lot of people who pay to joint the ship. That's how they get the economical ends to meet. I have watched some of the videos on Youtube of the ship, and people seems to be having a great time, and since all is manual, all hands are really needed in order to make things work, so people aren't just buying a cruise, but instead a "working holiday". Congrats on the new job. I've always lived by doing what I love and letting the money take care of itself. It has worked very well for me, I've lived a life of no regrets and much joy. Thank you, I tried to tell myself something like that too, and I quickly decided that I would rather be doing something that seemed exciting and getting a bit less in the pocket. And as the old saying goes: If you earn a little bit more than you spend you are rich. Wow that a beautiful ship and awesome job. I have always wanted to take a trip on a sailboat. The only ships I have ever been on were small coast guard ships that took us out and dropped us off in the ocean for survival training. Will you have to climb the rigging? It must be a great place to work, since one of the old chief engineers are still active as a stand in, and he is 73 years old. So I figure that if you are still longing to go to work at that age - it is probably a fine place to work. I don't think that I'll have to climb the rigging, but I want to try it, so I can get an understanding of the entire ship and all its systems. All those people that join the ship for a shorter or a longer trip are offered the opportunity to help working in the rigging, so I really want to try it too. 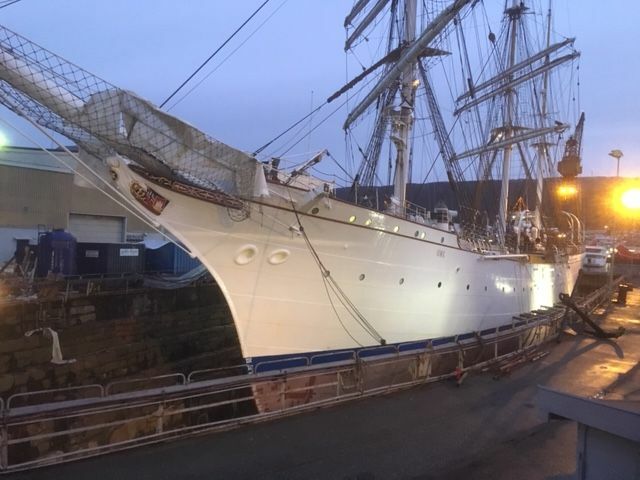 Statsraad Lehmkuhl Is Eye Sweet all the best on your new job Chief.. I'll do my best to make sure that the ship will stay beautiful. Statsraad Lehkuhl would look nice painted on the inside lid of your Sea Bourne Chest..
Perhaps I should start building a new sea chest. It has been a while since I did a chest project. Something new for the new year. Congrats and Happy New Year! Good luck with your new job. That's a beautiful ship. Happy New Year! It will be a pleasure to stay in port on a ship that people will actually be happy to walk by and look at. Life is about the pursuit of happiness not money. BTW we often have tall ships gatherings her in Halifax and you can still finds shops to do wooden tall ships repairs here in Lunenburg also. Hi Bob, Thanks a lot and happy New Year. Visiting Canada could be a fun thing, I hope that one day they'll organize a tall ships race that goes there. Just remember, on sailing vessels you can't count on plumb and you can't count on square. And tools roll to leeward, sometimes with greater vigor than on land. But I think that you are right about the square on this one too. All seem to be much more gracefully sculpted, so there are few straight lines. Congratulations. I’m excited for you. It will be an adventure for sure. Oh wow! What a cool opportunity, I hope it lives up to expectations, it seems like a good fit for your unique perspective and we all look forward to hearing of your new adventures. I am pretty sure it will be fun. The more I think of it - the more certain I am that it is the right choice. There are a bunch of videos on Youtube with the vessel, and it just looks amazing. You have reaped the blessings of Moulariprionia, sir. It's such an honor to be working on such a storied and impressive craft. I am not sure I want to make one though, but if it is required, I'd better do it. It will really be small scale woodworking, but now that you mention it, I haven't seen any woodworking blogs discussing how to make a bottle ship. So it might be worth trying.